To me, it’s few really well laid out objects that you can extend (make copies of) to fit your needs. There are 3 types. Models: These are at the heart of the whole thing. 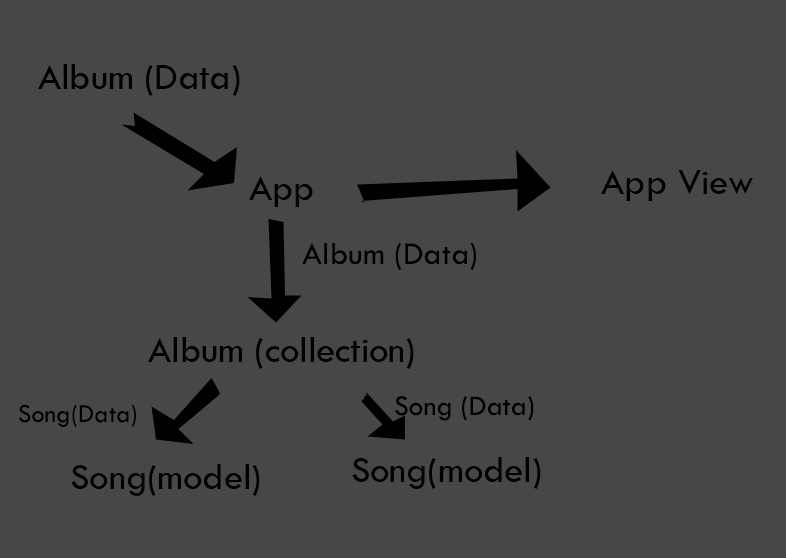 Each model represents a singular entry or event, such as a song, a user, or a message. Views: These are used to represent your models to the user of your app. Which is why they usualy contain a render() function. They are also in charge of collecting input from the user. Collections: As the name implies, they are a collection of things. What things? Models or views. Lets go over a fairly simple example of rendering an displaying the contents of an album. For spacial reasons, this album will only have 2 songs on it. Don’t worry, they are quality songs. Views either have a collection, or a model, that they reference. Collections have a model that they reference. We passed our album data into the app (which is a model), as we instantiated (loaded) the app. The app then went and made the app view (which is a view). After that we created a new album collection from our album data with something like this: this.set(‘currentAlbum’, new Album(albumJSON)); which got called inside the initialize function. We would have already told our album collection, that it is a set of songs. So the collection knows that when it gets created and passed a set of data, that the data should represent songs. The collection then automatically goes and makes a model for each song. –Will be updated with more, later.